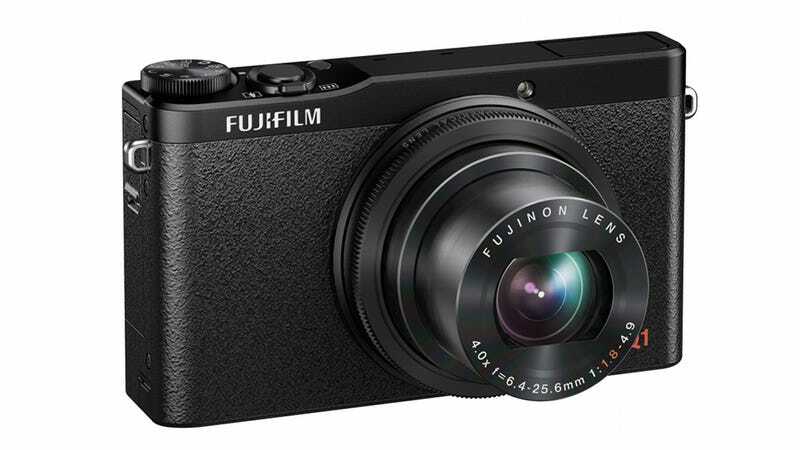 When Fujifilm announced its beautiful pocket camera, the XF1, last year we were genuinely psyched, which made the camera's disappointing handling even more of a bummer. With the XQ1, Fuji has fixed some of the XF1's annoyances and packed in the same hot image sensor that's on the badass X20. Now we're talking. Fujifilm is actually announcing two cameras in advance of this week's PhotoPlus trade show in New York. We'll cover the XQ1 first, and the upgraded, interchangeable-lens X-E2 below. The tiny XF1's principle annoyance is that in order to turn the camera on you have to extend the manual zoom lens with a turn. This is a clunky and slow way to power up a camera, and it was pretty much a dealbreaker. On the XQ1, Fuji has added a (gasp!) power button and is using an entirely new Fujinon 25-100mm f/1.8-4.9 lens that's powered by a zoom lever by the shutter release. With those important fixes in place, Fuji has also given the camera some powerful guts, inherited from the fixed-lens X20 announced back in January: A 2/3-inch sensor with the new X-Trans CMOS II architecture, and Fuji's latest EXR Processor II. Together, they enabled the X20 to achieve some of the fastest AF speeds on the market, great fine detail reproduction, and impressive low-light sensitivity. We'd expect this to carry over to the new camera. There's also Wi-Fi built in for easy image transfers, and the camera also inherits focus peaking and the awesome picture-in-picture manual focus assist from other second-generation X-series cameras. For the $500, the XQ1 is a pretty compelling buy—but the camera seems to lack the on-camera manual operability some more advanced photographers will be looking for. WE'll report back when we've had a chance to try it out. The XQ1 will be available this month. The new Fujifilm X-E2 is the follow-up to last year's excellent but overpriced X-E1 mirrorless, interchangeable-lens camera with an electronic viewfinder. Its 16.3 Megapixel APS-C sensor has been upgraded to the new X-Trans CMOS II and it also features the new EXR Processor II. Again, as with the XQ1 expect much faster AF performance and improved image quality. Fujifilm has also upgraded the video specs of the E2 from the last model, which only shot 1920 x 1080 at 24fps. According to Fujifilm's materials, the camera now shoots at "up to 60 fps." You can also use full manual mode when shooting video. The X-E2's pricing is unchanged: $1000 for the body alone or $1400 bundled with a XF18mm-55mm (27-84mm) lens. The key selling point for the camera remain excellent image quality, but for the money, you can certainly get a lot more features from competitors. Out November.